Hailed as the Best Picture in this year’s Metro Manila Film Festival, Bonifacio: Ang Unang Pangulo bravely showed the world the true-to-life story of our other national hero, Andres Bonifacio. It didn’t pull the stops on anything, regardless if the reputation of other supposed heroic figures are tainted by the revelation (once again) of the seeming truth. Kudos to Enzo Williams, the director of this epic movie. His name might be new to my ears but his work proved that he is a pro. His camerawork plays with the characters and the setting to a great effect. I am not surprised that he was credited as a supporting editor in the film because it seemed like you’d see his fingerprint with every scene. Meanwhile, the cinematography done by Carlo Mendoza was also very commendable. Scenes of major or minor importance are very pleasing to the eyes. It was that great. Moreover, it was for very good reasons that this movie raked on the MMFF awards on various sound categories (sound engineer and musical score). The score complimented every scene and enhanced the film’s heavy moments to an effect that goes straight to the audience’s heart. It is a wonder why Robin Padilla lost to Derek Ramsay on the Best Actor category. Surprisingly, Padilla toned down his acting here to portray Bonifacio. His signature Robin Padilla voice was still there (of course), but he used this to his advantage by embodying the hero with his manly voice along with his actions. On the other hand, Vina Morales reminded everyone that aside from being a singer, she still is an actress. But she’s not just an actress here in the movie; she’s a very good one. She impressed with her consistent showing of how Gregoria de Jesus, Bonifacio’s wife, could have been like partaking in the revolution while doing her duties and roles as wife. She stands out the most during the final scenes. She definitely broke many hearts here that’s why it’s also a wonder why she didn’t win in the Best Actress category. Meanwhile, the whole supporting cast proved to be good. Early on, the audience would feel that Bonifacio: Ang Unang Pangulo is a heavy movie. 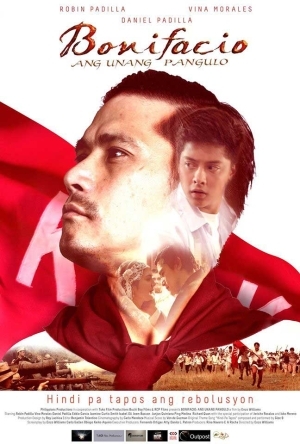 It reminded me of Supremo, a film shown two years ago that detailed how Bonifacio founded the revolution and died in the deadly soldiers of Emilio Aguinaldo. Supremo had such a heavy atmosphere, albeit showing a bloody but patriotic mood, which the audience right then might have really felt. But don’t be fooled about Bonifacio: Ang Unang Pangulo being not consistently heavy. Like Supremo, it is also very serious, just with touches of light moments to alleviate the heaviness. The idea of showing the present (what the students of today are asking about Bonifacio) in between scenes of the past (the Philippine Revolution more than a century ago) is great. If not properly taken care of, the switching of these scenes from past to present and vice versa might have not worked and have ultimately failed. But because it was well taken care of, the transitions were smooth and really effective. I like how the movie ended, especially the parting words of Bonifacio to the audience: “Inalay ko ang buhay ko para sa ating kalayaan. Ikaw, anong maiibibigay mo para sa bayan?” This movie is a timely reminder to everyone to never forget our history: what we were, what came and what we became to be. Such a statement boldly challenges the audience to not just experience the freedom that we have now but continue the fight for the real freedom: freedom from injustices, freedom from greed, and freedom from corruption brought about by power. The movie passes on to the audience the fire that Bonifacio, our iconic Filipino figure, is showing and living in the film. Any Filipino who would not be affected during and after watching the film might be very biased against Bonifacio, have grown apathetic to everything or are just brewing to be a traitor of the country. Haha, just kidding. That might be an exaggeration but I just wanted to emphasize that the film mirrors the past to what’s happening right now. We might be free from the colonizers, but are we free from our own bigotry? Do we really love our country or are we just in love with the idea of loving our country? Some of us might just love ourselves more than anything, and our country might just be our least priority. Ask yourself to know the answers. 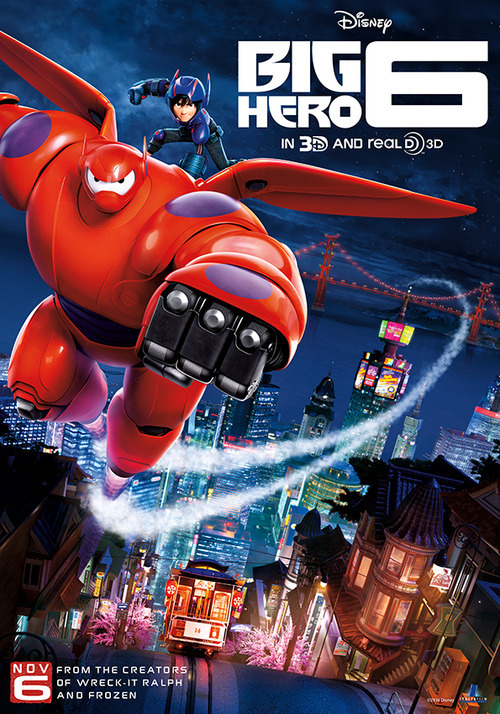 This movie derails the reputation of what was generally touted as a hero by being the so-called first president of the first republic. And this is for a good reason. If you were to study the Philippine history, Emilio Aguinaldo really is the reason why Andres Bonifacio was killed. If he were not hungry for power, Andres Bonifacio would have been alive to witness our freedom from the Spaniards. But, as they say, let bygones be bygones. We all just have to move on and… do a little bit more. We have to set the records straight about our national figures and give praise to those whose praise is due, and not just to those who are hungry for it. Do you think it’s time to set a discussion re: the movie’s claim that Andres Bonifacio is the real first president and not Aguinaldo? Maybe. If there’s a rare opportunity that I get to spend time watching a movie with a lot of moviegoers, it is during the Metro Manila Film Festival (MMFF). I rarely want to watch with many, many people inside the movie theater because I don’t want distractions while watching. Much more when the people who are watching with you are really noisy and unintentionally funny. However, I actually liked it while me and my family are watching Chito S. Rono’s Feng Shui 2. Ten years after the first Feng Shui film haunted the Philippine audience, the “promised” sequel finally arrived this year as one of the eight film entries in MMFF 2014. Still helmed by acclaimed movie director, Chito Rono, Feng Shui 2 pitted brilliant actors Coco Martin and Cherry Pie Picache with the remaining cast of the first film Kris Aquino and Jonee Gamboa. As soon as I heard that the well-loved horror film from a decade ago would have a sequel, I immediately put it on top of my must-watch movies this time of the year. 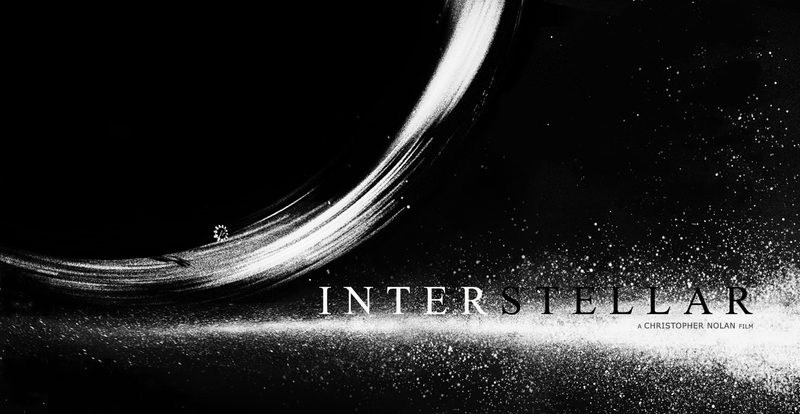 After watching some great things and not so good ones in the film, I could say that I actually enjoyed it. Now, what everybody should understand is horror movies are tricky. The types of thrill or suspense they give the audiences are based not only on the type of horror movie they are (i.e. ghost or supernatural movie, gory movie, horror/comedy movie, war movie, etc.) but also on the assembly of the cast and crew that they have. Feng Shui 2 is backed up by a great cast and production team (Star Cinema, no less) and one should have a feeling that after buying the movie ticket that they are in for a great ride. Did I get to have a great ride after watching the movie? In a word: yes. 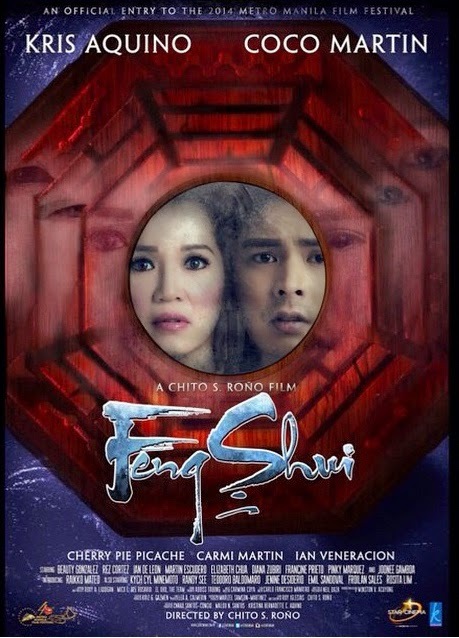 Even though Kris Aquino said that this film is not a sequel to the original, Feng Shui 2 is undoubtedly a sequel (she insisted it is only a continuation of the story; hence, a sequel). Anyway, flashbacks of scenes from the original were shown at the start: Aquino as Joy losing her family and eventually destroying the bagua. A new family was then shown to fall victim to the bagua’s horrifying curse and what I got was an immediate feel of rising tension in my bloodstream, which is, of course, a good thing when you’re watching a horror movie. Most of the first half of the film is about Lester (Coco Martin), a 32-year-old hustler who lives with his mother in a dilapidated house along the river. One assignment that he had was to retrieve a bagua from a fall victim. Unbeknownst to him, looking at the mirror of the bagua belies a curse that could kill everyone who looks at it after him. To his horror, he found death around the people he knows and loves comes by one after another. One fateful day, he met Joy, now a very successful real estate agent, who realized the ghost behind the bagua was coming after her again. With the help of Lily (Cherry Pie Picache), a survivor of the bagua curse, and Hsui Liao (Jonee Gamboa), a Taoist priest, will they ever save themselves from the curse of Lotus Feet, the ghost haunting the bagua? Early on, the signature touches that Chito Rono gives to his horror movies are evident in this film: a creepy atmosphere, a set of strongly written characters and a definitive setting. I liked how he playfully toyed with colors, set up most of the scenes and stylishly showed the contrasts of being lucky and unlucky in the film. 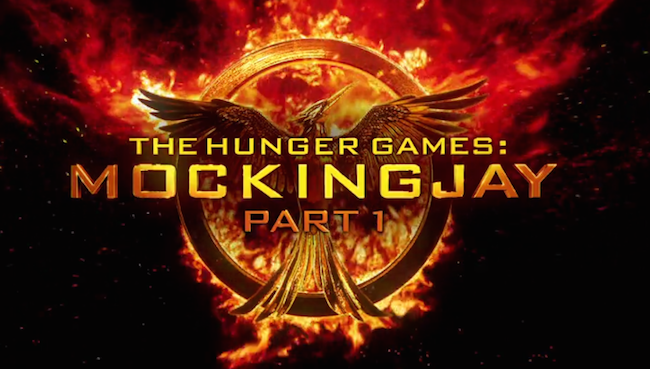 Unsurprisingly, there were solid scream-worthy or shout-inducing scenes thanks to great editing and camerawork. Evidently rising up to his role in the film, Coco Martin is impressive as Lester (though some of his speech sounds while shouting in one scene troubled me; excuse me, that’s me as a speech pathologist speaking hehe). Leveling to Martin’s brilliance is Cherry Pie Picache who in her relatively short stint in the film made a greater impression than Aquino. But not to worry, Aquino did well in the film (and this is a relief), much like the rest of the cast that includes Carmi Martin, Rez Cortez, Beauty Gonzalez, Ian Veneracion and Ian de Leon. However, a Filipino scary movie (heck, let’s make that a Filipino movie) without loopholes is pretty hard to come by. Feng Shui 2 is a good horror movie as it fulfills many standards being looked into a horror film, but it isn’t lacking with holes in its plot. For one, the immediacy of deaths of the characters was baffling. Moreover, the ways these characters died were somehow forced to fit in whatever Zodiac year they were born in no matter how senseless they might be. Meanwhile, the supposed fun of guessing how the characters would die was taken out here as opposed to the original. Items or objects that would link the characters to their possible way of death were either easy to guess or obviously presented. In short, it was highly predictable. Nevertheless, thanks to Rono and his editors, the movie’s consistency of good story-telling bypasses all these shortcomings. Combine a great cast to a great director with a consistent albeit far-fetched story and what you have is still a pretty solid movie. Add to that screaming males and females, both old and young in the audience and what you have is a good movie experience. Annabelle is a spin-off of the successful The Conjuring movies. But unlike its predecessors, its frights and scares came short. To be honest, I would say nary a real scare came out of this film. Many of the supposed scary scenes were just those jolts that you feel when you are surprised. 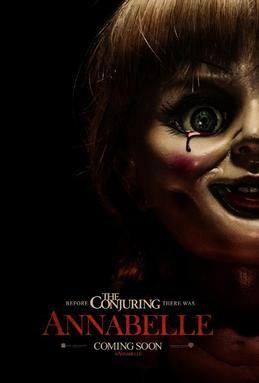 Annabelle is about a doll that was possessed by a female member of an occult who killed herself during a home invasion. The owners of the doll, John (a resident doctor) and Mia (who has just brought a baby daughter into the world) soon experience supernatural occurrences in their home. Even when they moved to an apartment in the city, the paranormal activities continued. They soon find out what’s causing these troubles. Heeding help from anybody they think who can help, would they be able to stop Annabelle? What are they willing to give just to protect their baby daughter? The first part of the film is actually good. The back story is well told, and the characters are adequately developed. The scary scenes on this part could shock you a bit but you’d want to expect something more. I am a fan of horror films and I’ve seen a lot. This one I did not like. After that good first part, the story moved on without upping the suspense. I liked The Conjuring and its sequel but this supposed prequel and spin-off to those two movies is a fluke. A lot of people say that they got scared of this film and I really wonder how and why. I might have enjoyed more a repeat of the horror films that I liked watching before than watching Annabelle. I like how the lead actors did their part (especially Annabelle Wallis as Mia) in the movie. However, no matter how they performed in Annabelle, they won’t be praised as a consequence of the film’s subpar quality. Their efforts are easily overshadowed by the fact that this movie is devoid of anything new, from the story itself up to the scare department. I can’t help but think that the decision to push thru with this spin-off is just all about the money. If you were to watch a horror movie that’s still showing out there, avoid Annabelle at all costs. Just rent a tried and tested horror classic and watch it in the comforts of your home.